Biomass energy is the energy obtained from plants or plant-derived materials. Wood is the most widely used source of biomass energy. Other sources of biomass include: terrestrial and aquatic plants, agricultural wastes, industrial residues, sewage sludge, animal and municipal wastes. In this, a thermo-chemical process is used to convert biomass to producer gas. Producer gas is a mixture of Carbon monoxide (CO), Hydrogen (H2), Methane (CH4), Carbon dioxide (CO2) and Nitrogen (N2). The sources of biomass in this include wood and its products as well as various agricultural residues. Upon gasification, this can lead to power generation in the range of 10 kW – 1000 kWe. The energy produced can also be used for thermal application in small industries up to 3 MW. 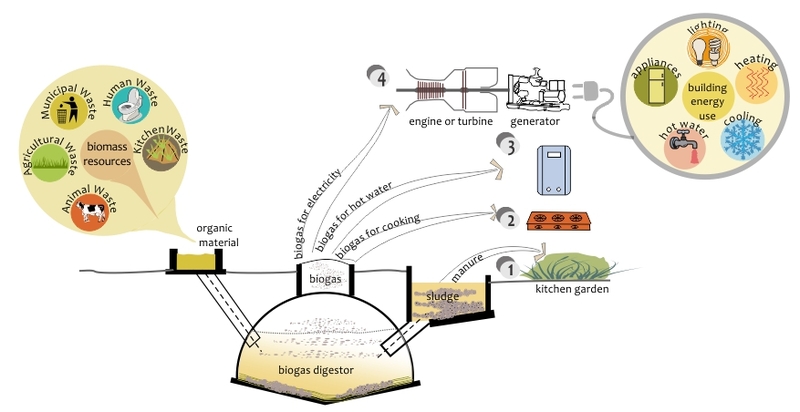 In this, Bio-methanation process is used to convert biomass to biogas. Animal dung is commonly used in production of biogas. The Biogas produced can be used for cooking in households as well as for electricity generation. The process of trans-esterification is used for production of bio-diesel. Bio-oil is also extracted from oil seeds. The source for biofuels is non edible vegetable oil seeds. Biofuels are used for electricity generation as well as motive power. The use of biomass energy greatly reduces dependence on fossil fuels. The products used for conversion of biomass to energy are abundant in nature and the energy is renewable in nature. Biomass being a clean energy resource receives various tax benefits from the government. Biomass production utilizes crops, trees, residues and other resources from land. These need to be done at a sustainable rate so as the removal rate of resources should not deplete resources for future needs. The cost of power generation using biomass is impacted by the plant load factor as well as the cost of fuel. Biomass gasifiers have attractive payback periods when used in thermal mode to replace fossil fuels. The moisture content of the fuel needs to be below 20%. High moisture leads to lower calorific value of producer gas. BEAT (Biomass Environmental Assessment Tool) (UK based tool) – BEAT was developed on behalf of Defra and the Environment Agency by AEA and North Energy Associates. This tool assess the benefits and impact of bioenergy technologies. It assess the diverse availability of feedstocks, available technologies, and associated environmental impact for UK only.